Why is it that films about marriage in its twilight years seem to be some of the most harrowing movies out there? There seems to be something about exploring a couple’s relationship after an extended period of time that brings out some pretty powerful emotions from its filmmakers, and writer-director Andrew Haigh now follows in the footsteps of Michael Haneke’s Amour with his own vision of an advanced, but increasingly fragile, marriage. 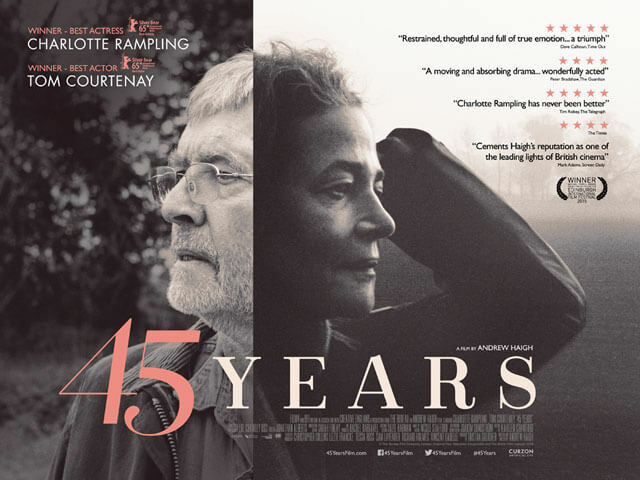 45 Years takes its cues from David Constantine’s short story In Another Country, and focuses on middle-aged couple Kate (Charlotte Rampling) and Geoff (Tom Courtenay) as they prepare for a party to commemorate their 45th wedding anniversary. The week before the event, Geoff receives a letter informing him that the body of a former love, Katya, has been found preserved in an icy glacier in the Swiss Alps, after many years of being missing. Though it seems to be nothing to them at first, it soon becomes apparent to Kate that her husband is more shaken by it than he lets on, and certain revelations cause her to question the legitimacy of her marriage. Right away, Haigh makes this film a quiet and moody affair, with long shots of the Norwich countryside providing a breathable atmosphere which only serves to become more isolated – and more cloudy – as the film progresses on. It slides along at a slow and steady pace which allows the weight of the emotion to settle in and make itself comfortable, simultaneously creating a subtle sense of tension as you wait for confrontations that may or may not even happen. Parts of his direction even play around with conventions of other unrelated genres to build the tension, horror being one of them; there is something unnerving about discovering loud creaky noises in their attic in the middle of the night (really Courtenay rummaging about finding some missing photographs of his lost love), and the symbolic unnerving that Rampling’s character experiences brings about fears of not knowing who’s above her, even when she fully knows it’s her own husband. His script is simplistic and informative enough to establish the relaxed nature that keeps everything refreshingly grounded; not once will you see a shouting match between the disagreeing couple, nor will you be forced into choosing sides by its end. It is left open enough for us to make our own assumptions, and Haigh makes the wise choice of keeping things smooth and bottled up instead of going overly dramatic like a lesser director probably would have. Haigh is able to accomplish this particular goal thanks to the wonderful performances by Rampling and Courtenay. Both actors were awarded separate Actor and Actress prizes at this year’s Venice Film Festival, an occurrence that is virtually unheard of at other festivals (at Cannes, for example, no film usually wins more than one award), and it’s easy to see why; their understated work here progresses the film’s themes of choice and regret fluently, with both displaying several layers of emotion sometimes without even uttering a single line of dialogue. Rampling, in particular, carries the bulk of the film’s drama as she slowly discovers a little more about her husband’s true loyalties, and comes to heart-breaking realisations that culminate in the film’s final few scenes, where both she and Courtenay bring out some of their strongest moments of acting in years. This is only Haigh’s third film, after well-received dramas Greek Pete and Weekend, but he has already reached a level of maturity and intellectual understanding that other directors have to wait until at least their fifth or sixth film to finally master. 45 Years solidifies his already-promising career as both a writer and director, balancing heavy themes with two outstanding performances by two seasoned actors, and managing to make it an effective film that, while a little slow and repetitive in certain areas, is a strong calling card for raw and quietly effective British drama. 45 Years is another strong entry from writer-director Andrew Haigh, perhaps his strongest film to date from a thematic perspective, and he has two fantastic performances from Charlotte Rampling and Tom Courtenay as a bonus addition in his quietly effective tale of middle-aged marriage in an increasingly fragile situation.